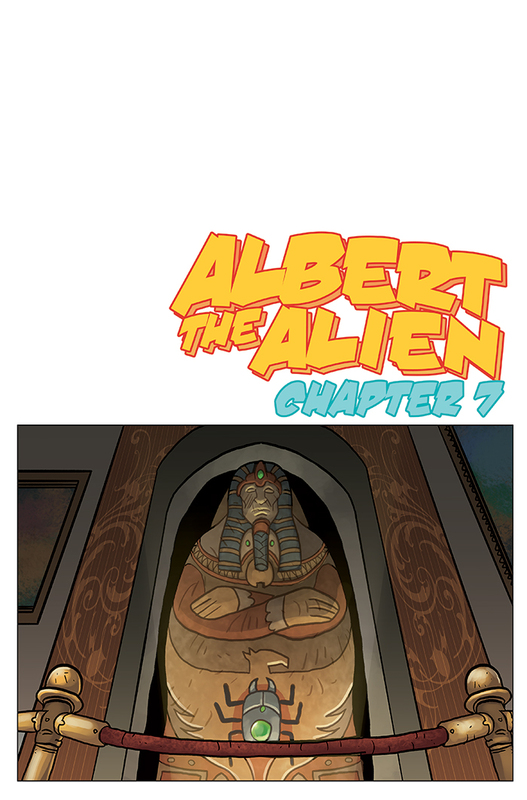 Welcome to the cover for the next chapter of Albert the Alien! In this adventure, Albert is going to take his first field trip on Earth! The class goes to a museum for a exhibit on the Mummy King. However, Wally “accidentally” brings the Mummy King and his generals back to life! Can Albert and friends stop the Mummy King and save the city? Albert the Alien continues to update Wednesdays and Fridays at www.AlbertTheAlien.com, and Tuesdays at www.Thrillbent.com (not an all-ages site). Thrillbent is a paid service (only $3.99 per month, and you get access to some amazing comics), but they are about 4-6 weeks ahead in the story. So come back next week and check out the new adventure! And remember to tell your friends about Albert the Alien!